The vocational journey of Dana Delap has been a saga of epic proportions, spanning decades (really, honestly!). Now the end inches into sight, at least in epic terms, and I’m struck by the number of clergy who are keen to put me off. I spoke to one of the collared ones this week – I had left an answer phone message for her on Monday. She was getting back to me on Friday. This was, she said, the first time she had had a moment to ring in a frantic week. Did I really want to take on this job? My first answer to that is ‘no’. All of us have the occasional work crisis, when there is no choice but to pull a late, if not all, night shift. But the implication from many clergy is that this is something they live every week. Is that commendable? I would say that it is a very poor example to those around them, who have to manage their time better or collapse. Sadly many clergy do! My other immediate thought – if Adrian were asked by a would-be fundraiser whether fund-raising is a good job, Adrian would beam, jump up and down, and cry, ‘Yes!’. He loves what he does and loves others to discover what a fantastic job it can be. I know because I’ve seen him in full ‘jumping up and down’ enthusiasm. 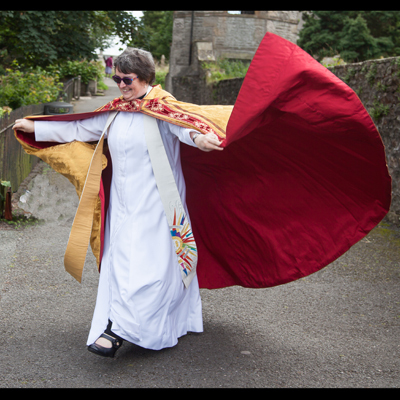 Ask a priest, and they will ask if you really, really want to be ordained, because you’d be mad to want to… Obviously, not all clergy, but enough to make me very sad. Call me naive and unrealistic, but I have always found serving God and God’s people to be the best job in the world. And taking enough time off to remember that is obviously something only lay chaplains are allowed to do! By the way, we spent the second night of our honeymoon near the ‘Rest and be Thankful’ pass in a cold, isolated and miserable inn. We moved the next night to something much more luxurious. Remember to choose carefully where you rest and are thankful! God-sent: that’s you! Running away from what God is asking us to do only results in tired legs and no time to ‘rest and be thankful’ (and he still gets us in the end)! God’s people will be the poorer for it if you don’t do what God very obviously made you for. But take a moment to print off your blog entry and pop it on your study desk to remind you to do the right thing – ie ‘rest and be thankful’ (never easy) – when you do have those inevitable ‘frantic’ weeeks!